Primrose's gameplay is deceptively simple: You're given random pairs of colored tiles that you must place on a 7x7 grid. When you surround a group of one color with another color, the surrounded group clears, scoring points. The surrounding tiles flip to the color of the tiles that were cleared. When tiles flip color, chain reactions are possible. Larger groups and longer chain reactions are awarded more points. 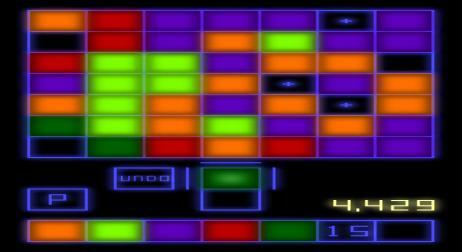 As the game progresses, more colors are added to the pool, making the grid more and more constrained. Pressure builds until the grid finally fills up, and the game ends. Despite this mounting pressure, the game doesn't have a frantic feel, because you have as much time as you want to make each move. Whereas games like Tetris depend on getting faster and faster to be challenging, Primrose derives deep challenge from inherent properties of its mechanics.